What is the premise of John Byrne's Next Men? Do I need to read the original Next Men comics to understand the new ones? 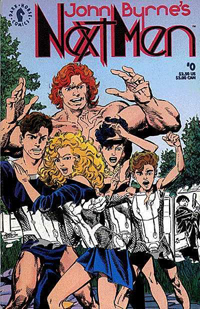 Why is the Next Men comic coming back now? When does the new JBNM series arrive in stores? Will the new Next Men series continue the original numbering? Will the new Next Men comics emulate the writing style of the original? How will the art style of the new Next Men comics compare to the original? Will the new direction include any of the comics culture satire from the first 31 issues? Will the new Next Men comics include "A FLAME ABOUT THIS HIGH"? How many issues will the new Next Men comic be? Will Gary Cody be painting covers for the new Next Men comics? Question: What is the premise of John Byrne's Next Men? Five mutates from Project Next Men escape the elaborate decades-long secret experiment to find themselves in a completely unfamiliar world. During a mysterious encounter in the desert, Bethany, Nathan, Danny, Jack, and Jazz begin to realize that they had been locked in a shared fantasy-world. Now they must come to terms with the real world and their strange powers before their former captors track them down. From his interview with First Comics News when asked "Who are the Next Men?" John Byrne: A group of young people who were � somewhat violently! � let loose from a secret government genetics program that had been operating since the 1950s. Each has what would be, in comicbook terms, a �super power�, but this is not a superhero book. Question: Will I have to read the first 30 issues of the original run in order to understand what's going on? John Byrne: When [IDW's] Chris Ryall finally talked me into brining back JBNM, one of the things we were both concerned about was making it easy for readers completely unfamiliar with the book to jump on without having to read any of the previous issues. To this end, I came up with a structure for the first issue that does just that -- but I'm still worried that some retailers and fans (even well meaning ones -- remember GENERATIONS 3?) will start telling potential new readers that they "have to" read all the previous issues before starting in on the new series. So here it is: YOU WILL NOT HAVE TO HAVE READ ANY OF THE PREVIOUS ISSUES IN ORDER TO PICK UP THE NEW ONES. Trust me on this! And SPREAD THE WORD! Comment: I'm glad that readers will be able to jump on board with issue #31 without first having to read anything else. However, I really hope that those who haven't read the first 31 issues of JBNM (and/or 2112) will be "triggered" by the new stuff, and become inspired to pick up the collections at some point. I want as many people as possible to experience those incredible Next Men stories! John Byrne: That would be ideal, of course! As I mentioned in another thread, the other day, one of the most destructive phrases that as worked its way into comic reading is "What's a good jumping on point?" Whole "generations" of potential readers have been scared away by the idea that there is no way to simply START READING, as I did lo these many years ago. And it certainly has not helped that far too many writers now THINK in terms of "jumping on points" -- not in the sense that EVERY issue should be one, but that by throwing out a "jumping on point" every once in a while, they are free to ramble on with their lazy, undisciplined, "decompressed" stories. These guys should be tossed into a time machine and sent back to 1956, where they would be forced to write "jumping on point" stories THREE TIMES PER ISSUE!!! Gun to their heads, I'll bet most of these wankers could not write an eight page, done in one story. Question: Is there a special reason/story as to why now is the time it is coming back? John Byrne: I have said for years that I was waiting for the marketplace to recover enough that I felt I could bring the book back without it sinking without so much as a ripple. I fear that -- the marketplace recovery -- is never going to happen, so when [IDW's] Chris Ryall said "How about NEXT MEN?" for the 437th time, I said "Okay." Clearly I am never going to be able to put these stories anywhere else, and I need to get them out of my head!!! 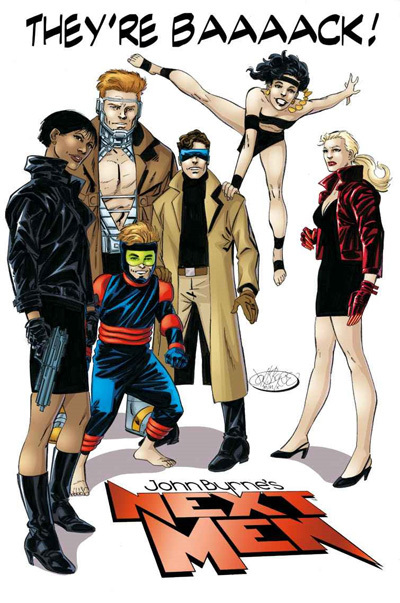 John Byrne's Next Men returns to stores in December 2010 according to IDW's press release. To read the complete Press Release from IDW Click Here. Question: Will you be continuing the original issue numbering? John Byrne: That's the plan. Altho it needs a little something extra to allow new readers to jump right in, this will, for you Old Timers. be nothing more or less than the Next Issue. Question: Do you anticipate any difficulties "jumping into the story" after all this time? Has this kind of situation (picking up a storyline several years after you've dropped it) ever occurred to you? John Byrne: This is a first, and I was a bit wary going in. I was sort of afraid / would have to read all the back issues!! But, I sort of calmed down and let myself drift around the stuff, and bit by bit the pieces started to come back together. In fact, I even found a place to use something that had occurred to me only recently, but seemed to have no "home". I realized one of the subplots of NEXT MEN would be much better served by this new idea than by what I had planned originally. Question: Your writing style will undoubtedly have come on since JBNM appeared 20 years ago. Will you be trying to emulate your old style in the storytelling too? John Byrne: One of my smaller vexations in life is when writers revisit their old stories but, because they have changed some of their attitude over the years, end up damaging those old stories. This is something I will be trying very hard to avoid. I know there are future "generations" who will be reading the TRULY "compleat" NEXT MEN in compilation form, and I want the join between the last page of issue 30 and the first page of issue 31 to be as seamless as possible. Question: How will the overall �look� and �feel� of the book compare to what it was back in the 90�s? Of all the pages I did on NEXT MEN, this was my favorite. Can't really say why, but as you can see I immediately brought it out and affixed it to the corner of my drawing board, and THIS is the look I will be attempting to recapture for the continuation of the series. Question: Will the continuation's background technology will be consistent with the original? John Byrne: One of the things a lot of readers didn't seem to pick up on was that NEXT MEN was set "in the future". I did not specify just how far -- luckily, as it turns out, since I would have caught up to and passed the period I had in my head quite a while back -- and, since technology in the real world has not matched what I had in JBNM, the book can still be set comfortably "in the future". Quite a long way in the future, in fact, by the time I'm done! Question: Will you include more of the ongoing comics & comics culture satire that was threaded through the original series? That was one of my favorite aspects. John Byrne: When JBNM went on "hiatus" I was preparing for a major change in the direction of the stories -- Hey! Dinosaurs! -- and that, with some minor modifications, is where I will still be going. Very little of what's coming up will be set in the Next Men's "present". Question: Will this series also have a letter column like A FLAME ABOUT THIS HIGH that ran in the original series? John Byrne: No plans for a lettercol or AFATH. In conjunction with this Forum, I think that would definitely qualify as overkill! Question: Are you planning on your initial estimate of around 20 issues (to #50 for the ending) or are you going to let it ride longer? 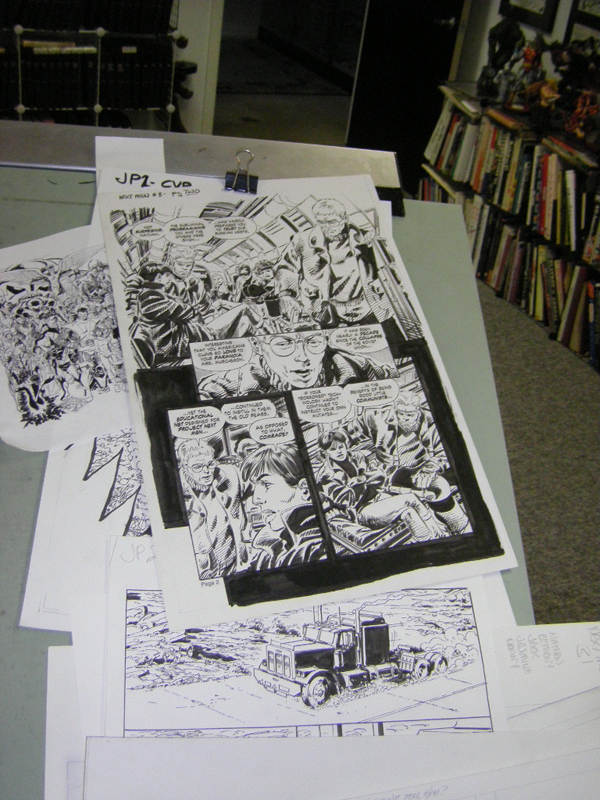 John Byrne: I'm going to allow the story as much time as it needs -- which is pretty much how I operated before on JBNM. 20 issues was an estimate. Might work out more, might work out less. Certainly "targeting" the 50th issue for the last makes sense. Question: Any plans on getting the great Gary Cody back for the painted covers? John Byrne: Not in the foreseeable future. Gary is a tad too busy with his own career! Question: I'd forgotten how evil Hilltop was in #28. Argh, I really want him to get his comeuppance but we know he survives until 2112 don't we??? John Byrne: In 1990, Stan Lee contacted me and asked me if I would like the be "editor-in-chief" of a whole new line he was going to create at Marvel -- a line which would be set in Marvel's future, unconnected to the Marvel Universe as we knew it. As it happened, I had been giving some thought to a "Futureverse" of my own, and, being flattered by Stan's offer, I suggested that what I had come up with (but at that time thought I had no place to develop) would fit the bill for his project. To this end I plotted (Stan was to script) and drew a 64 page "pilot".